The complete beginners guide to misprints and rarities. Hello! If you're reading this then it's very likely you've opened a misprint and are looking for more information about it! 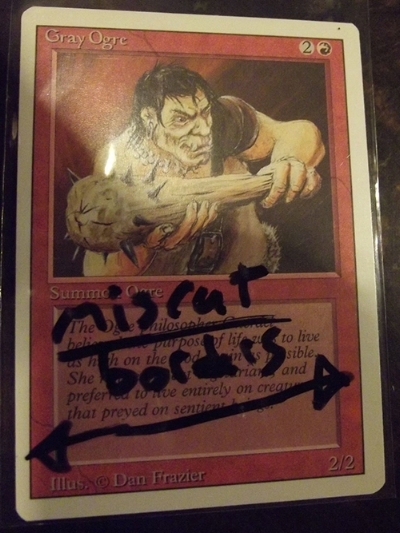 I've written this guide as a comprehensive introduction into the world of Magic the Gathering misprints. While the information in this guide is specifically catered towards MTG cards, a lot of it can be applied to ANY collectible card. Also, don't let the title deceive you. This guide can be beneficial to not only complete beginners but collectors of any level of expertise! Your exact misprint might not be pictured in this guide, but after reading this, you'll be able to correctly identify the category/cause of your misprint! I hope that you find this guide easy to use and useful. To get the greatest benefit, I highly recommend that you check out the other main articles in the navigation bar above. Thanks for checking this out! If you've got any questions, feel free to check out the F.A.Q. and if your question still isn't answered, send me an email. General rule of thumb: If it doesn’t show a 2nd card, it’s NOT a miscut. A miscut card is a card that wasn't properly aligned while it was being cut from a sheet of magic cards. Miscuts are one of the most common types of errors, but that doesn't mean they aren't valuable. There are two important things that can make your miscuts worthwhile to collectors: The card it's on and/or the severity of the miscut. What is miscut and what isn't? Despite this eBay seller's detailed sleeve illustration, this is not miscut. This Gray Ogre is not a miscut. It isn’t even off-centered enough to be considered off-centered. If you have a card like this, and think it’s miscut, please re-evaluate. (Image courtesy of random ebay seller). This Fault Riders is off-centered. Notice how it DOES NOT SHOW A 2nd CARD. The little white dot in the bottom left is known as a registration dot and isn't a misprint either. Off-centers can be neat, but the majority of collectors really don't care about them. There are a few exceptions to this (only for off-centered cards to the degree shown in the image or similar). If your off-centered card is a Legacy or Vintage staple, or highly sought after card, it’s very likely worth more (usually not very much more though) than its non-off-centered counterpart. About as close as you can get before being a miscut. See the tiny blue sliver of a 2nd card at the top? We have a confirmed miscut! 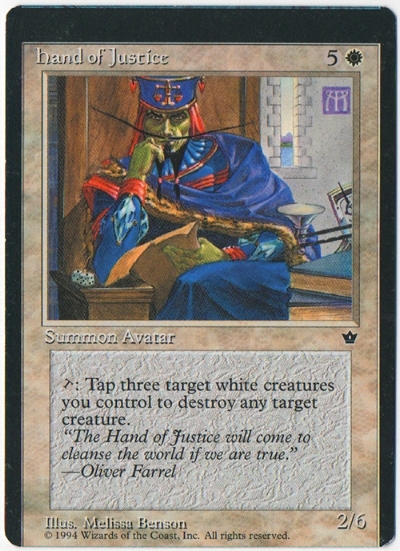 This Hand of Justice is a miscut. It’s not terribly exciting, but the key point here is that it SHOWS A 2nd CARD on the top. You’re not looking at a significant premium with this severity of miscut unless it’s a Legacy, Vintage, EDH, Modern, and sometimes Standard playable card. Now with this Drudge Skeleton we’re starting to get somewhere a little more exciting! If you have a miscut like this or bigger, then you’ve got something worthwhile for your collection. 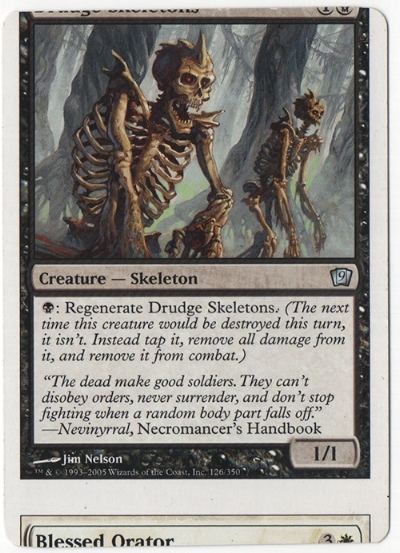 You probably noticed that I called this a Drudge Skeleton and not a Blessed Orator. THERE IS NO OFFICIAL RULE THAT DETERMINES WHAT THIS CARD IS. There is a commonly believed misconception that the visible name of the card is what the card is, but it's just that, a misconception. I've written an article that covers tournament legality as much as is currently possible if you'd like to learn more. Drudge Skeletons or Blessed Orator? You decide. 'Horizontal miscut' refers to the direction that the sheet has shifted prior to cutting. While there's technically no universal terminology, this is what most collectors go by. It’s also worth noting that miscuts can happen horizontally. While they are a little less common than their vertically miscut counterparts, there is no real value difference. What’s this white stuff or all of these colors? This is what a miscut card from the edge of a sheet looks like. Some will even have text and other technical print data on them. These are usually worth more than a miscut from the center of the sheet (card dependent of course). Property of Wizards of the Coast, not for Resale....unless it's printed on the card! Seven miscuts are better than one! I have more connecting miscuts that belong to this group, they just don't all fit on the scanner at once. You can also find connecting miscuts. On average these are good to collect or sell as a set, and the more connectors you have the better. However, there is usually a high likelihood that one or several collectors are only interested in specific cards of the set. This makes selling these sets a little difficult if you have a "keep them all united" mindset. In very very rare cases, a card can get misaligned on 2 axis (horizontal and vertical) and get miscut in a way that shows more than 2 cards! "If this is soooo rare then why can you find a ton of extremely miscut cards like that on eBay?" you might be asking. Those cards are not miscuts, they are NFC. This card wasn't cut at the factory. It's from a full sheet of cards that was intentionally miscut by hand. It's neat, but it's not a misprint. NFC stands for non factory cut. That means that these cards are cut by third parties from sheets of uncut magic cards usually given away as prizes at events. I decided to go more in depth about NFC cards in their own article, which you can read here. While this card looks really similar to the NFC card above, this is actually one of the super rare cases where a miscut this extreme left the factory and found it's way into booster boxes! While the overwhelming majority of 4-way miscuts that you see are NFC, its important to note that there are also legitimate miscuts that show 4 cards. They're super rare. I've only seen them in French FBB Revised, Fallen Empires, Homelands, Weatherlight, 4th Edition, Ice Age, Jpn. Shards of Alara, one from Eldrich Moon, one from Dragons of Tarkir, and one from Amonkhet. Crimps happen when a card gets misaligned during the process of being sealed into a pack. You’ll notice that the indent pattern on your crimped cards align with the pattern on the sealed part of a booster pack. Crimps can happen on the top or bottom of a card. While crimps are a little less common than miscuts, they're usually desired less by collectors. Crimps can also happen vertically. These are rarer than other crimps because they happen in the back of the pack. This plains shifted a little bit while getting crimped and ended up pretty mangled. Different regions package cards differently. As a result, there can be different indentation patterns in crimps. If a card is severely misaligned during pack sealing, it can get crimped twice or even have part of the card cut off. In some rare cases a card gets halved, and in even rarer cases you can find both halves in different packs. This card managed to survive getting chopped, resulting in two very clear crimps on the same card! This card got chopped a little bit shorter than intended. Luckily the other half was also found in the same booster box! The zig-zag crimp pictured directly above comes from a small Italian company that sells repacks. The crimp comes from the outer clear plastic packaging that the company uses to group their product. Every crimp that we've seen with this pattern has been an Italian language card. It's possible that this crimp pattern exists in other languages, but is most likely the result of 3rd party involvement. Ink errors are the misprints that happen during ink application (aka printing) and are easily the most common type of misprint. There can be several reasons why something goes wrong during the printing process. If you want a better idea of how magic cards are made, check out this article. Ink errors can be fairly common, and a lot of the time you'll see a 'common' ink issue with new sets. They key thing to note is that desirability of ink errors are directly related to the severity of the error. If you can't easily spot the error, it's likely nobody will be interested in it. I've written an article on how to appraise your misprints, which I highly recommend for everyone. Ink errors can usually be classified into one of two categories: Additional ink & missing ink. Lets take a closer look at the various incarnations of each of these two categories. When a small particle or piece of debris/dust get attached to one of the print blankets, we get a small error known as a printer hickey. Hickeys can come in many different shapes, sizes, and colors and are most notably identified by a miscolored blot with a miscolored 'halo' around its edges. While there's no definitive guide on how large a hickey has to be to be desirable (yet) anything smaller than a mana symbol probably won't yield any interest. The hickeys on the Bloodhall and the Dragon are not large enough for my tastes and reside in my "Junky Misprints" box. Smudging is usually a minor misprint where the ink that has been laid down on the card gets a little smeared. Smudges are primarily on the text layer. Sometimes this happens because a little too much ink got transferred onto that layer. Smudges have to be fairly extreme for them to generate any real interest from collectors. Too much magenta ink bled on to the card so it looks red! Bleeding is a similar type of error to smudging, but more exciting because it happens on one of the color layers. Excess ink gets transferred and smeared across the card, creating a colored wash effect. This usually happens on part of a card, and the value is determined by how much smeared ink is clearly visible. Looking at the mana symbols we can see 2 additional copies have been printed on this Breathstealer's Crypt! It's most clearly readable in the sun behind the eagle, but if you look closely you can see medical disclaimer info across the entire card! It's also neat because the text is mirrored! Similar to the double prints above the rubber transfer rollers are sometimes not cleaned properly from previous print jobs, leaving residual ink that gets transferred onto cards. The most famous of which are the Charlie Brown Medallions. This error can (and has) happened with any type of printing, not excluding other sheets of mtg or medical disclaimers. While I couldn't tell you the difference between a blotch and a splotch, they both are acceptable terms for this type of misprint. These happen when something gets onto the sheet or roller that prevents the ink from properly sticking. It’s also worth mentioning that these errors can happen across multiple cards. This Copper Carapace is a great example of a large blotch, and also shows us that the Black Text/Borders layer is printed last! This Lifelace was printed when the printers were running low on black ink. Cards missing the black layer in the art are the coolest looking variant of this type of misprint (in my opinion). If you haven't read the article on how MTG cards are made yet, you'll learn that the cards are printed in several layers. The first layer is the black (K) art layer. This is then followed by the Cyan (C), Magenta (M), and Yellow (Y) layers respectively. Additionally, there is another layer of black afterwards for the text, mana symbols, and borders. Any of these layers can be low or missing their ink entirely. I've used Photoshop to approximate what MTG cards would look like with each possible missing layer variation. When a card is missing the C, M, &Y color channels entirely, it is referred to as an Albino. If a card is entirely missing only one or two of the color channels it is referred to as either a partial albino or as an albino prefaced by the layers that are printed (ie CK only Albino would refer to a card with only the black and cyan inks). The following sheets of full albino cards are known to exist: Ice Age, Antiquities Commons, Revised Commons, French Mirrodin, Italian Legends, 4th Edition, and Japanese 7th Edition. When looked at with a jewlers loop or high resolution scan, only black print dots are visible. This is a CK Only Albino, not to be confused with a sunbleach. I still need to work on my in depth article about how to tell the difference. While this Vampire Lacerator has a severe blotch and isn't technically 'albino' it serves as a good example of what to look for on albinos. We can see the part of the card with the C, M, & Y dots and the section above it missing those dots of color entirely. These are some sun bleached cards I made as an experiment. Be careful of people trying to sell sun bleached cards as misprints! These may look like albino’s, but they are in fact not even misprints at all. These are sun-bleached cards. They were left out in the sun (or in a window) for an extended period of time and allowed to fade. The key thing to look out for are the blues. For physics reasons, blues are the last color to fade. Scuba divers will tell you the first color to fade the deeper you dive are the reds (this has to do with light wavelength). Enough about physics, they’re fakes, don’t buy em. Also note that foil cards can be sun bleached as well. This close up comparison shows the clear difference between a sun bleached card and an albino. Cards are printed in sheets of 11 x 11 (121 total) cards. When you don’t have enough cards to fill a sheet, you get a blank spot. These blank spots occupy a spot on the sheet (hence the name filler) and come in many different forms. Below are a few examples of fillers, but if you would like to see a complete list of most known fillers check them out here. The leftmost filler is super common. The bar code filler in the center is a lot less common. The M filler on the right is really rare, but easily one of my favorite fillers. There are several variants of these fillers! The all black and all white fillers can be 'faked' so be sure to take a very close look at the card surface to make sure nothing fishy is going on. Smell the cards. Yes, I said smell. Chemicals like acetone can be used to remove ink from cards, and some dopes have been known to spray paint cards black in attempts to pass them off as fillers. The plain white filler with black borders above is the most common filler. It has a normal magic back. Average market price for these is between $5 and $15. They come in foil as well, but be sure to take a very close look at it before you pick one up since they're easy to fake. The ink on a foil is easily removed using acetone or an eraser. Typos, wrong casting costs, missing power/toughness, and even wrong art! Sometimes people just make mistakes and with all the language and print variations there is plenty of room for things to go unnoticed. These errors are usually present on an entire print run, partial print run, or a specific language version of a card. For a lists of these kinds of misprints, check out Squt’s Misprint Page and this thread from the librarities. This is a Serra Angel with the art and card frame for Time Elemental! This Slinking Serpent was printed without its power and toughness. It's supposed to be a 4/3! Sometimes cards miss the edge cutting die and get shipped with square corners. Cards can have 1, 2, 3, or 4 square corners. Multiple square corners are always on adjacent corners, most commonly either the left or right, but top and bottom are also possible. I have only seen one example where the two diagonal opposites were square and the other 2 normal. 4 Square corner Animate Dead from Graveborn. There have been mistakes in the past where the incorrect corner cutting die was used to round the corners of cards. This has happened a few times in the history of MTG, but is most commonly found in 4th edition. It has also happened in Ice age and Revised, but are quite rare. Many revised cards exist with corners that were trimmed by their owners to match their Alpha or Beta cards, so only purchase Alpha Cut Revised if you know how to tell the difference, or trust your source. From Top to Bottom: Alpha Cut Revised, Alpha Cut Ice Age, Alpha Cut 4th Edition, and Just a normal Alpha Card for comparison. Sometimes, like in miscuts, cards will shift while they're getting their corners trimmed. If a card shifts far enough, you can end up with a corner in a spot where there wasn't supposed to be a corner! The square corners on these cards are great indicators that these are factory errors. On the Cult of the Waxing Moon, you can see the bottom left corner punch midway through the text box. If that square corner wasn't there, I'd be very cautious about its authenticity. WotC added foil stamps to cards to designate them as promotional and in the current days as a means to authenticate the rares and mythics. This additional step to the printing process has added more room for error, which is something misprint collectors like us love. Sometimes a card that is supposed to have a stamp, doesn't go through the stamping process at all! When this happens it's usually a common error for those specific cards. This holiday promo is supposed to have "Happy Holidays 2013" stamped onto it, but was accidentally released without it in a Target blister pack distribution error. Visually similar to missing stamps (well a little bit similar at least) cards sometimes get stamped without all of the foil. This usually leaves an indentation in the card, which can sometimes be seen through the back. Holostamps are commonly found in crescent shapes which happens when the stock holofoil roll doesn't feed properly under the stamping die. That results in a holostamp being pressed into the car with holofoil that already has an oval cut out of it. Look Closely at this Sage Eye Avengers and you'll see the indentation where a promo stamp is supposed to be. The holostamp on the Bygone Bishop was pressed in using already used holofoil. The result is a Batarang shaped holostamp due to the cut ovals on each side. You may be starting to notice a theme here. Errors happen when something gets shifted or misaligned in the printing process. Date and hologram stamps are no exception to this. They've wandered just about every place you can think of on a card; bottom, top, corners, upside down, and even on the 'back' of flip cards! The stamp on the Relic seeker is a little difficult to see here, but it's upside down on the left side of the card. 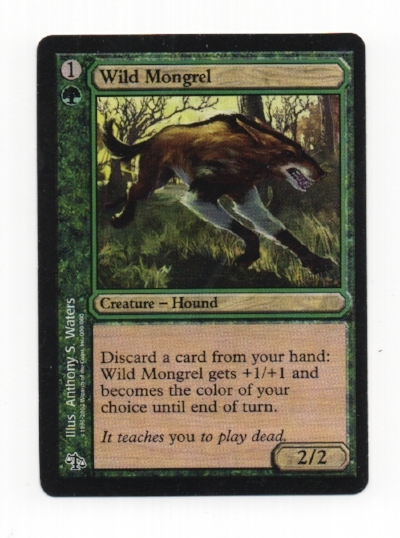 Shifted stamps are fairly common during modern day pre-releases, but are much more difficult to find on older cards. In rare cases cards get stamped twice. This can happen with the holo stamp or with promo stamps. In a few rare cases some cards get a little bit of extra WotC authentication. The Russian Wingmate Roc pictured here is actually a fairly common example of this, but it has also been seen on other cards as well. This Chaos Maw not only has a shifted holostamp, but also a line of additional holofoil across the entire bottom of the card! These are sets of magic cards that were intended for release, but due to various issues were canceled and were never supposed to hit store shelves. Despite getting axed some amount ended up in circulation anyway. This has happened twice in the history of Magic. Printed by the United States Playing Card Company in 1995 this 'set' was an attempt at using a US based printing company. It didn't end up working out and the cards were supposed to have been destroyed. You can most easily identify Alt 4th cards by looking at the back. The top right corner of the A in Magic is dark, where on normal magic cards it's light. The cards also have the feel of normal Poker cards and don't glow under blacklight like official MTG cards. 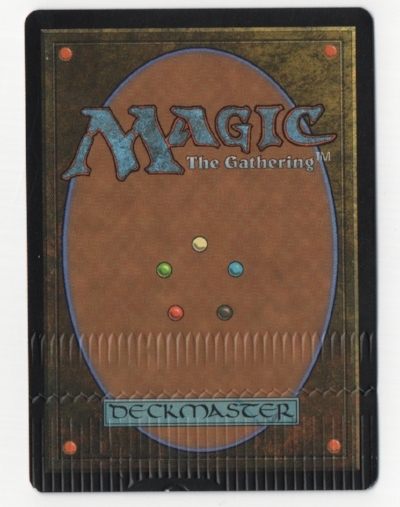 Alternate 4th edition is found exclusively in starter decks, which can be identified by the "Made in the U.S by the United States Playing Card Company" marked on the side of the boxes, or the ISBN numbers 1-880992-26-4 or 1-880992-25-6 on the back. Discovery of Alt 4th is attributed to Dan Bock, known for lighting his home exclusively with black lights. The back of an Alternate 4th Edition Hurloon Minotaur. The top of the A is dark. Go ahead and compare it to your normal Hurloon Minotaur. Summer magic was intended to fix a whole bunch of printing errors from Revised. While they did fix a few of the errors, they ended up making more than they started with (the most famous of which is the Blue Hurricane) and called for the destruction of the set. Before its destruction, some of it was given to WotC and CartaMundi employees, and a few cases made it out to the public. To identify summer magic, look at the copyright line. If it's a Revised card and has "Illus. (C) 1994" followed by the artist's name on one single line, it's summer magic. When WotC wants to test something that affects the card design or layout, they print out some tests to see if they like them or not. Tests have been made for everything such as figuring out what foil cards will look like, what a potential new card frame could be, how to add the holograph authentication stamp, and even tests for the recent 'meld' mechanic. Test prints make it into the public's hands either through error, or more commonly through people with connections to former WotC employees. There are lots of test prints out there, but here are a few for you to look at. 8th Edition Test print where they wanted to experiment with a new card frame! The thought was that with the CMC on the left, you can easily fan your cards and know what you have. Each of these also has a counterpart with the CMC on the right! This Test Print Primal Clay was used to test a variant of the authentication hologram that started in M13. Interesting side note, the foil used on this card is leftover hologram foil from a Chineese tobacco company. These are the result of the old foiling process. Many do not consider these misprints. When you tilt the card back and forth you can see two different foil sections. These can be vertical or horizontal (much more common than vertical). In an attempt to figure out what a cutline is, I wiped the ink off a cutline with acetone so I could get super close up images of one. It appears to be a physical gap between separate sheets foil that have been joined together during the manufacturing of the foil cardstock. While these are technically a layout alignment error I felt it was appropriate to include these under the foil error categories. Shifted foils are a result of...well...shifted print layers. Various parts of the card such as the text or card frame layers can be offset vertically or horizontally. To learn more about print layering check out my article on How MTG is Made. The following sheets are known to exist as shifted foils: Mercadian Masques Common (V&H), Urza's Destiny Common (V), Urza's Destiny Rare (V), German Mercadian Masques Common (V), German Scourge Common (H), Judge Promo Thran Quarry (H), Judge Promo Gaea's Cradle (V), Urza's Legacy Uncommon (V), Urza's Legacy Common (V), Judge Promo Stroke of Genius (V), Mercadian Masques Rare, Japanese Urza’s Legacy Rare, and Japanese Urza’s Destiny Rare. Foil cards get an extra layer of ink applied to them before the CMYK layers called the underprinting layer. The underprinting determines which parts of the card allow the foil to show through and which parts are masked. 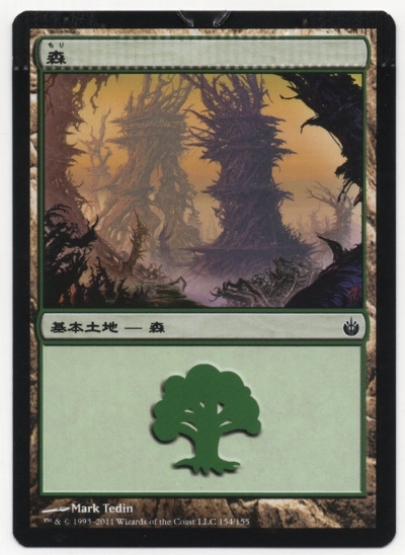 I cover underprinting in more depth in my How MTG is Made article. Like any part of the printing process, things can go wrong here too! When the underprinting layer isn't properly aligned, it gives the card an offset ghosted effect. 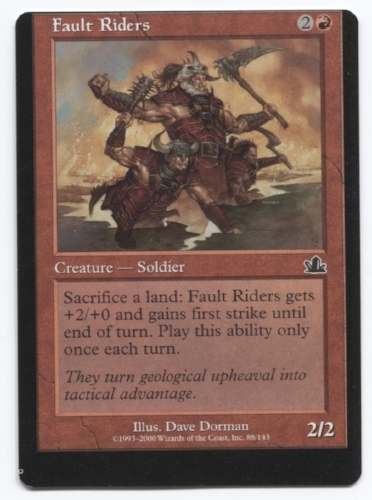 This error seems to be most commonly found on FTV cards. The shifted underprinting layer gives this card a ghosted effect similar to some double prints or registration errors! Cards that are missing the underprinting layer have a uniform foil effect across the entire surface. Parts that should be opaque will have a foil sheen to them. Also some parts of cards, such as the FNM watermark in the text box, are purely distinguished by the underprinting layer. If the layer is missing, it'll appear as if the watermark is missing, which happened to a lot of FNM Fatal Pushes. The Earth Elemental on the left is missing the uderprinting layer. The center one is a normal one for comparison. 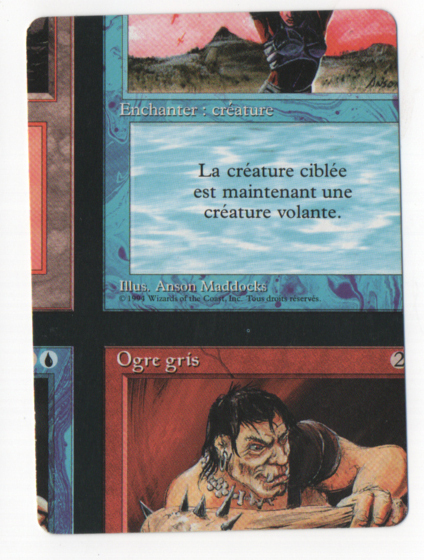 Notice the difference in foiling on the creature and the text boxes between the two versions. The one on the right is a quick recreation of what the underprinting mask probably looks like. Black indicates 100% masking and White indicates 0%. Some cards have gotten the underprinting layer from an entirely different card or frame template! The most common are the ones from the standard showdown packs: Captain's Claws/Goldnight Castigator, Fling/Toolcraft Exemplar, and Tormenting Voice/Drake Haven. Other known examples include GP Promo Grizzlebrand and various Japanese M15 green foils. Captain's Claws with Goldnight Castigator underprinting. Tormenting Voice with Drake Haven underprinting. The underprinting on this Abolish only lets the foil show through in 3 horizontal stripes on the top, middle, and bottom of the card. Categorizing misprints into groups by type isn't always easy. Here are some miprints and rarities that you should know about, but fall into their own small categories! Because cardstock is sensitive to moisture, pallets of sheets are stored wrapped in plastic. The plastic is held in place using tape. In very rare cases, this tape can make it onto sheets and get printed on top of! We've seen two types of tape used; traditional masking tape and a red glossy tape. These are what WoTC designers use to test cards before they make it to the printing press. Playtest cards from older sets were simply printed out on small pieces of paper. I would only buy these playtest cards from trusted sources as they have the potential to be very easily faked. Newer playtest cards were upgraded to stickers that are placed on real MTG cards. In very rare cases a sheet will get folded over during printing, resulting in a blank spot on the card. In super rare cases, a card is cut while folded, leaving a little bit of extra cardboard attached to the card (aka a ‘flag’)! While this error can visually resemble miscuts, it happens due to an entirely different reason. The backs of MTG cards are printed first. During the printing of either side, if the sheet is fed incorrectly (upside-down or offset) one of the sides will not be properly aligned. Sometimes sheets can be inverted and misaligned (these can show 4 cards too)! The miscut rule of thumb applies on non-inverted back versions of this error (needs to show a 2nd card for anyone to care about it). Flipped back on a Masques Swamp! The back on this disfigure is ‘miscut’ but this happened because of how the sheet was fed during printing! Different than the "double prints" mentioned earlier in the guide, these cards have gone through the printing press with the incorrect side getting printed on during a 2nd (or sometimes 3rd) pass. There are a few possible variations of this misprint and has been known to exist in Fallen Empires, Mercadian Masques, Tempest, French Scourge, Japanese Nemesis, Weatherlight, and 5th Edition! These cards have magic fronts and backs from a game called Wyvern. These are technically Magic fronted Wyvern cards since they were only found in Wyvern starters. I suppose that it's worth mentioning that this has happened with other products besides Wyvern (such as the Harry Potter TCG and Pokemon) but those are astronomically more rare than their Wyvern counterparts. Well that about wraps it up. You should have a pretty complete understanding of a good portion of the misprint and rarities world. If you have any questions feel free to contact me! If you disagree with anything written, feel I’ve missed anything vital, of have found this guide to help you, let me know! Thanks for making it this far, and enjoy collecting, because there’s some crazy stuff out there.